Roll your way through 24 huge levels across six different themes in this fast-paced 3D platform game. Be prepared to take on spikes, mines, dynamite, conveyor belts, springs, switches, doors, bumpers, lasers, saws, fire, ice, water, electricity, trapdoors and much much more. Each level has three areas you must navigate your way through, battling a host of enemies along the way, then a fourth and final area where you must take on one of the six end-of-level bosses! Grab the protective stars as you go and keep an eye out for the many hidden bonuses to help you on your way. 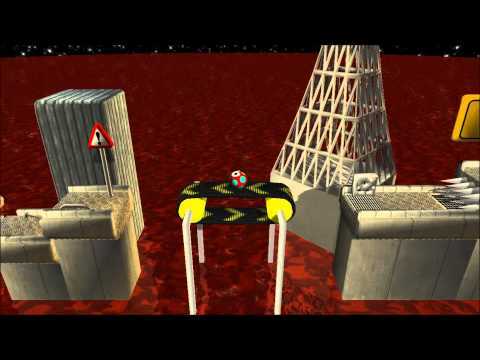 On a Roll 3D is a classic platformer that mixes the regular 2D format with a 3D twist as many of the platforms cross in front of each other. There are plenty of puzzles thrown in that combine realistic physics and logical reasoning with switches, levers and pushable blocks required to open doors and trapdoors, and to reach otherwise inaccessible places. On a Roll 3D is an immensely fun and very challenging retro platform game! On a Roll 3D was released on Xbox One 140d ago in the US and the UK. Notify me when On a Roll 3D is available.